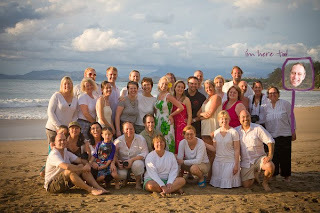 Foodspiration: What exactly did we do at Food Blogger Camp? We've been back a few weeks now since food blogger camp and we realize we never really said exactly what we did there or who else we met! In addition to the technical details of blogging, we spent a day in the markets in Zihuatanejo checking out the fresh fruits and vegetables and meats. We stopped at Fonda Irma, one of many ready-to-eat food stands in the market, and tasted specialties like chile relleno, chicken molé (above) and goat soup. The food was incredibly authentic and delicious! 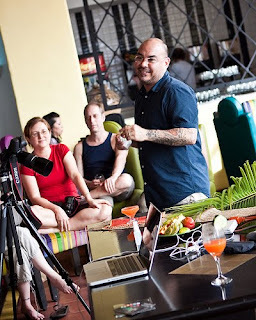 Most importantly, Justin and I felt inspired to learn even more, to practice what we learned in this week and to grow our new connections with other food bloggers. Justin and I are looking forward to putting our learnings into action! We thank you for reading our blog and looking forward to sharing new things! Thanks for another great Food Blogger Camp post. I think I'm living for these posts so that the incredible trip continues on. We're too. Bring back that gorgeous weather too! Hey Lauren and Justin, I enjoyed meeting you both. Look forward to seeing how your blog develops as a result of our discussion. I’ve tried the same thing with the other method before and I guess I just didn’t have enough patience to do it again as per your method !! thanks ! !